The Impact Hub’s Downtown Santa Barbara location was buzzing with innovation, high-energy and an entrepreneur-building community over the weekend. 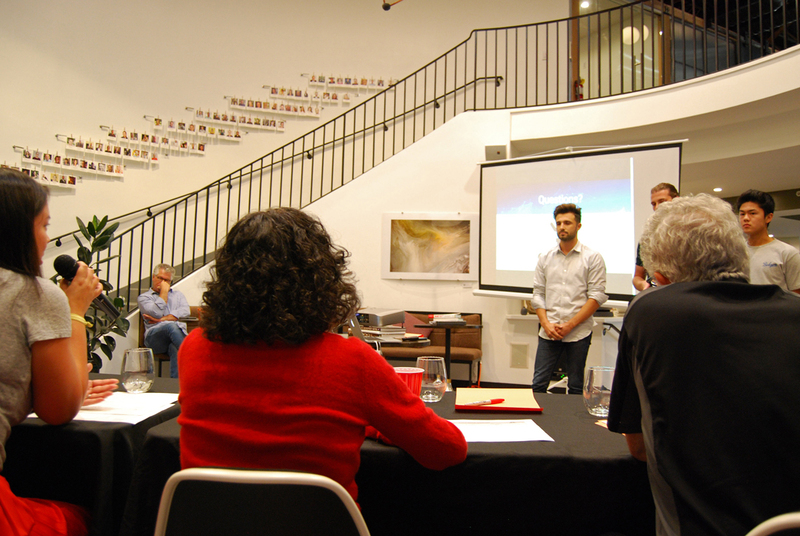 Some 60 creators had three days to propose a company idea, form a team, build and launch a new product, as well as presenting their outcome to an audience and panel of judges. About half of the participants traveled from outside Santa Barbara County, with some coming from San Francisco, Silicon Valley, Los Angeles, Ventura and San Luis Obispo counties, and one person flew from Georgia. The startup accelerator event gave entrepreneurs a way to gain real-time experience growing a business, expanding their resumes, portfolios and building networks. It was hosted at the 1117 State St. Impact Hub location. The weekend activities kicked off Friday with rapid-fire startup pitches where attendees presented their designs and inspired guests to join their team. Participants then built a prototype and received mentor feedback from business leaders and keynote speakers. The teams continued mapping out their ideas Saturday. Sunday afternoon closed with a Shark Tank-style judging session where the groups demonstrated their prototypes to a panel of investors. A wearable sensor device, called Titan, helps the users sense their surroundings. The device buzzes when someone approaches the person closely from behind. Texttrade is a mobile app platform that helps college students sell used textbooks for a reasonable price. Menus, a data collection service, gathers information about what users eat and sells the survey information to third party entities. The main goal of the weekend was to build the community around the local startup scene, event volunteer Navjot Brar said. Entrepreneurs also had the opportunity to utilize the Impact Hub’s co-working space, free website domain and a 3D printer. “The networking and education are arguably the greatest value from the weekend, in addition to all of the tools we supply for businesses to get started,” Brar said. At the end of the event, the judges awarded a first, second and third place winner. The team earning first place created a prototype that helps with group payments, reminders and messaging. Dimein is a trip planner that assists large groups coordinate a vacation. Second place winner — Datum — helps find quality vendors in the aerospace industry. The business aids companies searching for connections, rates participating vendors, and certifies sellers to ensure value. An app called Localize took third place. It brings users one click closer to engaging with local politicians and city council members on the issues that matter to residents.